On June 1, 2013 Frank and Jenn became Mr. and Mrs. Hallak. 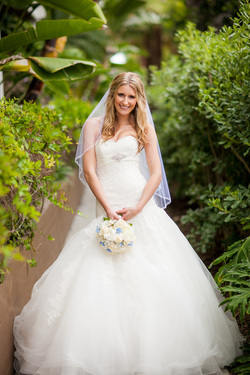 A wedding blogger and coordinator herself, she finally got to experience life as a bride. With a love for the beach but knowing that wind and sand don’t create a very romantic ambiance, they chose the Portofino Hotel & Marina in Redondo Beach, CA where they said their vows in a small, quaint garden right on the water. And with large families who love to celebrate, the party started immediately following the ceremony in the beautiful oceanfront banquet rooms where the lights of Palos Verdes sparkled on the water all night long. While family and friends are very important in their lives, they created a party feel where guests listened to great music and danced the night away. With all of the aspects of the wedding still incorporated in their big day – communion, toasts, the first dance, and even cake smashing – they always kept the marriage at the core of their plans, often reminding themselves that the flowers and the (wrong) cake showing up that day were not the center of their marriage. A beautiful evening they will remember for years to come, Mr. and Mrs. Hallak began their journey as husband and wife!